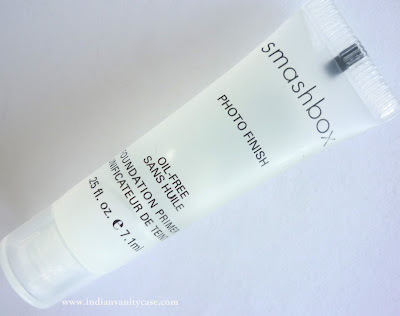 Smashbox Photo Finish Foundation Primer was part of the Smashbox Superstars that I got last year. I've been using this primer since then, and the first 2-3 times I thought it's one of the best products ever! It minimized my pores & made my skin so silky and smooth! And then when I used it after that, maybe in early December, I got the most painful and angry pimples I've ever had on my forehead near my hairline, and on my chin- which left a scar! This is because it has Dimethicone, better known as Silicone, which is known to clog pores and cause breakouts. Still, I wasn't ready to give up on it, so on Friday, I used it again and the next morning, ta-da two pimples again- on my forehead and cheek area near my nose where the larger pores are. Sigh! But this time, they are small and not so painful. *The best way to test foundation primers & line fillers is to apply them in the thenar space between your thumb and index finger. 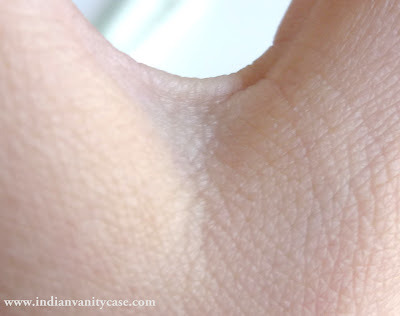 See how it evens out the skin and fills up lines? Isn't it so sad that it comes with a pus-filled price? I'm just glad I didn't buy the big sized bottle, like I planned. I generally avoid primers for this reason itself - they have a very high concentration of silicons that gives them that slippery, smooth feel, which I personally don't like at all - each time I use it - it feels like a film over my skin.. I generally keep it for big events only.. I dislike their primers as I have used two samples. Both made my skin feel really smooth but when people took my photograph, I looked like I had a white furry face. Try Korres, they're really good. I think you might just develop resistance. Sometimes I feel that leaving pores open in pollution like this is worse. I have a tip for you. If you pay attention you will know when you might be developing pimples..that area starts itching a little before hand. When you feel that put very little white toothpaste there and you will not get the pimple. Make sure you use WHITE toothpaste and put it BEFORE getting pimple and use a very small amount. This thing made my skin dry n flaky - no breakout but. Totally hated it.Thank god, it was just a sample size from Smashbox n I din't splurge on it! Since then, I tend to stay away from gel based primers. Oo I would stop using it. There are other primers to try that do not contain silicone or a lower concentration of it. I hate the way this prime makes my skin feel and daily use makes my skin flakey and gross. Thanks for the testing tip. I don't have issues with silicon, so I guess it didn't irritate me for that reason. In fact, I break out because of foundation near my nose and this primer helped me not break out by making a shield. We all have different skin, I guess. rhamnousia- I so wanna try Korres products! I had the same reaction with MAC's Prep+Prime primer.. the pimples were the cystic kind and they took ages to go away. I now use Laura Mercier's oil free primer. It's not perfect but it makes my makeup last a whole day at work and it does not break me out. try the inglot under makeup base. its fabulous. I was actually planning on getting this product after my NARS primer runs out. Good thing I found your review! You saved my skin and my wallet. Thanks Cynthia!